An international team of researchers compared frog populations in mature palm plantations that were about 21 to 27 years old with populations on plantations that had been re-planted within the past two years in Sumatra, Indonesia. 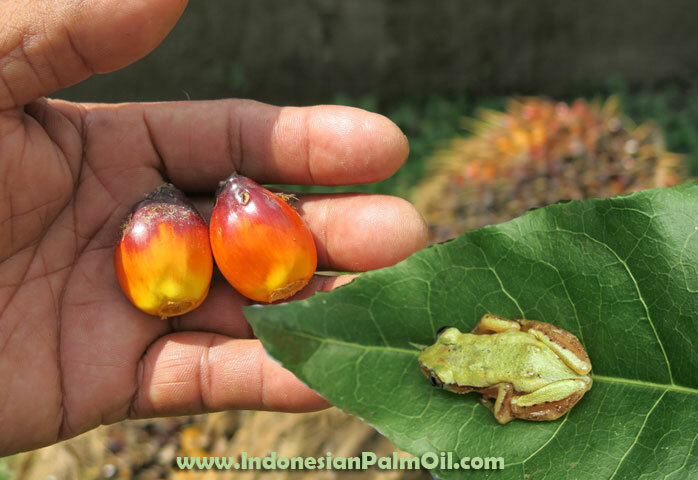 They found a loss in both number of frog species (31 percent lower) and number of total frogs (47 percent lower) in young oil palm plantations as compared to mature plantations. The researchers say that practices such as staggered replanting and maintaining connectivity between mature oil palm patches could help maintain frog diversity, but more studies are needed for the many different types of wildlife that live in oil palm plantations. It’s well known that when forests are converted to palm oil plantations, biodiversity suffers. But oil palm trees only last for about 25 to 30 years, at which point they are cut down and the plantation is re-planted with new trees, leading once again to dramatic changes in the local ecosystem. What happens to biodiversity then? The impacts of these abrupt periodic changes due to the life cycle of palm oil plantations are less well known, as it turns out. Can the re-planting process be improved to mitigate the detrimental effects on flora and fauna? An international team of researchers with the SMART Research Institute in Indonesia, the University of Cambridge in the UK, MIT-Woods Hole in the US, and the University of Würzburg in Germany have attempted to begin answering that question in a new study published by the journal Biotropica. The team compared frog populations in mature palm plantations that were about 21 to 27 years old with populations on plantations that had been re-planted within the past two years in Sumatra, Indonesia. The majority of frog species encountered by the researchers were disturbance-tolerant, although they did find four forest-associated frog species on mature oil palm plots, despite there being 28 kilometers (about 17 miles) between their study sites and the nearest tract of forest. The young, recently re-planted oil palm plots contained fewer of these native and forest-associated frog species. The researchers say that practices such as staggered replanting and maintaining connectivity between mature oil palm patches could help maintain frog diversity. Re-planting huge areas of oil palm all at once leads to the worst impacts on biodiversity, whereas re-planting in a staggered way could help ensure older oil palm patches stay connected, allowing frogs to move between the older oil palm areas and hence creating the conditions for a more diverse population of frogs to persist. Implementing management practices that result in lower impacts to biodiversity are especially key given that the oil palm trees planted during a mid-1980s boom are reaching the end of their life cycle, and large amounts of oil palm are currently being replanted. “We’ve known for a long time that we need to protect large areas of forest, but our study provides hope that important conservation efforts can also take place in ordinary working landscapes like oil palm,” David Kurz, who led the study while at the University of Cambridge but is now a PhD student at the University of California, Berkeley, said in a statement. Kurz and his co-authors say that more studies will be needed for the many different types of wildlife that live in oil palm, including ants, bats, bees, beetles, birds, small mammals, and snakes. But in the meantime, they say that improved re-planting approaches and maintenance of understory structure in oil palm can help alleviate the impact to biodiversity right away.